The second edition of Loftus’ Financial Reporting has been updated for recent developments in the Australian Accounting Standards, including the release of new standards on accounting for revenue and leases and updates to AASB 9 Financial Instruments. All incorporated updates are in line with developments in the International Financial Reporting Standards (IFRSs). The new edition has been written in accordance with the requirements of the relevant pronouncement(s) in the IFRS Red Book 2016 published by the IASB, which includes the most recent version of each Accounting Standard and Interpretation at 13 January 2016. 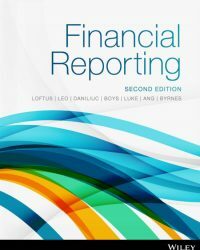 A hallmark feature of the text is that it provides both a conceptual understanding and a practical application of the accounting standards. For students, an understanding of the conceptual basis of accounting and the rationale behind the principles is crucial to the consistent application of standards in a variety of practical contexts. Available as a full colour printed textbook with an interactive eBook code included, this title enables you to master concepts and succeed in assessment by taking the roadblocks out of self-study, with features designed so you get the most out of learning. This rich digital resource brings financial reporting to life with media such as videos, case studies, interactives and revision materials embedded at the point of learning. Expansive Coverage: Designed to cover all the core topics from the two financial reporting units – Financial Reporting and Company Accounting. Practitioner Videos: Exclusive videos from high-profile practitioners from BDO provide insights into the real-world application of accounting. Scaffolding at the Point-of-Learning: Demo problems, interactive questions and other revision materials are embedded throughout the text to remove the roadblocks to self-study. Homework Tools: Algorithmic exercises to facilitate drill and skill homework. Sorin Daniliuc, is a lecturer in the Research School of Accounting at the Australian National University. He holds a PhD in Commerce, a Graduate Certificate in Higher Education from the Australian National University and a Bachelor of Economics from the ‘Alexandru Ioan Cuza’ University of Iasi (Romania). Sorin is a member of CPA Australia and the special interest group on accounting education at the Accounting and Finance Association of Australia and New Zealand (AFAANZ). He has extensive experience in teaching both introductory and advanced financial accounting courses to both undergraduate and postgraduate students, and is involved in designing learning materials for the CPA professional level exams. Sorin’s interests lie in the areas of corporate governance, business combinations, consolidations and corporate restructuring. He is particularly interested in factors that can improve the performance of corporate mergers and acquisitions. Noel Boys, BBus (Accountancy), Grad Dip Ed, ASA, is a Teaching Fellow at the University of Melbourne lecturing in Financial Accounting. Noel began his career in auditing at Arthur Young (now Ernst & Young) before moving into accounting education. He has been actively involved in the design and delivery of several accounting subjects at both the undergraduate and Masters level, as well national graduate training programs for mid-tier accounting firms. Noel was an academic consultant on the CPA Australia project that created the ABC Learning Case Study DVD teaching resource.